David Duerkop teaches a Vinyasa style steeped in basic yoga fundamentals but often sequenced in creative ways. He will encourage you to have fun and challenge yourself while honoring your individual needs. David fuses old school fundamentals and traditions with new school sequences and music to create a lighthearted, fun and supportive environment for self-discovery through yoga. He has taught thousands of yoga classes and completed multiple training's and certifications with Rusty Wells, Baron Baptiste, Manju Jois. David began his association with The Chicago School of Yoga in 2009. Kali Om has been teaching yoga since 1998 and is certified at the highest (ERYT-500) level. A disciple of Sri Dharma Mittra, she completed his 200, 500 and 800-hour trainings, and is the senior teacher of Dharma Yoga in Chicago. She also studied five times in India with Ashtanga Vinyasa yoga master Sri K. Pattabhi Jois and completed teacher trainings with Manju Pattabhi Jois and Suddha Weixler. She is also certified in Yoga Therapeutics, Psychic Development, Yoga Nidra, Seniors’ Yoga, Prenatal Yoga, Gentle/Restorative Yoga, and Hormone Yoga Therapy for Menopause. A columnist for Yoga Chicago magazine, she leads retreats locally and in Belize. Read her yoga articles at www.yogikaliom.com Kali's association with The Chicago School of Yoga began in 2010. 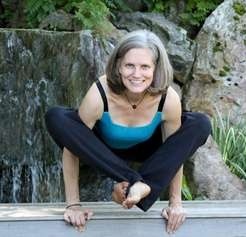 Shanna Linn has studied and practiced yoga since 1992; her commitment to teaching anatomy as it pertains to yoga reflects a life-long interest in the body as a path to the mind, and their union as a path to consciousness. She holds degrees from the Chicago School of Massage Therapy, Tyler School of Fine Art, and SAIC. Shanna is the Events Manager for Moksha Yoga Center and Stonehouse Farm. Stephanie is a dedicated student of yoga. Her journey started with her first Indo-Tibetan college course under renowned Buddhologist, Professor Robert Thurman. With an eagerness to learn more about the subtle body, she fell in love with yoga through Sivananda. Later, she explored Ashtanga, and her teaching career brought her to Chicago School of Yoga training. Kathryn a graduate of the Chicago School of Yoga, fuses old school fundamentals and traditions with new school sequences and music to create a lighthearted, fun and supportive environment for self-discovery through yoga. A former lacrosse player and corporate consultant, she aims to cultivate balance between strength and length, sweat and stability, time on and off the mat. Kathryn offers both private training and group yoga classes, scaled to individual goals and needs. She has Prenatal, Kids, and Trauma-Sensitive Yoga certifications and has experience with injury prevention, functional medicine, and active rehabilitation. Kathryn also volunteers with Yoga for Recovery, bringing yoga and mindfulness to women at the Cook County Department of Corrections.